Here's a peek at another spring collection we have to look forward to! This might be one of my favorites so far! "Color Club lets you create high-fashion looks for every identity with Alter Ego, their latest collection of diverse, long-lasting lacquers! Alter Ego’s consists of 12 shades! Go incognito with our opaque shades or rendezvous in full view with our sheers of Alter Ego ‘LIGHTS’ and ‘DARKS’! Alter Ego’s ‘Reveal Your Mystery Collection’ 7 piece salon pack includes Get a Clue, Revealed, Incognito, Secret Rendezvous, Sheer Disguise, and Give Me a Hint shades plus Milky White Base Coat. 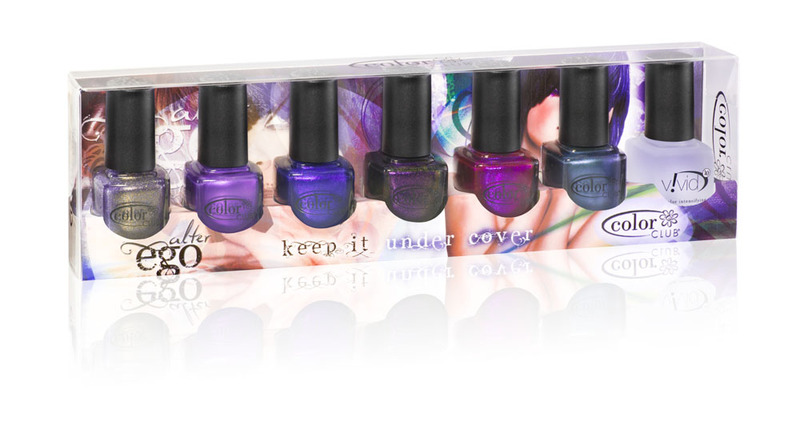 Their ‘Keep It Undercover Collection’ 7 piece salon pack includes Alter Ego, Secret Agent, Total Mystery, Alias, Ulterior Motive and Masquerading plus Vivid Top Coat." Of course you know I'm really interested in the DARKS! The Lights half of the collection may interest some of you ladies for work! I am super excited for the Darks! Look at all of those gorgeous purple-y looking colors! One even looks duochrome-y! Yayyyyyyyy I love Color Club! I also like that Taupe-y color in the Lights. I guess I can't get enough of those greige/taupe colors. What do you think you'll get from Color Club Alter Ego?